Haiku by anonymus (USA). Artwork by myself. Such a quiet and peaceful New Year here. Sunny and not much wind. Great two days so far. 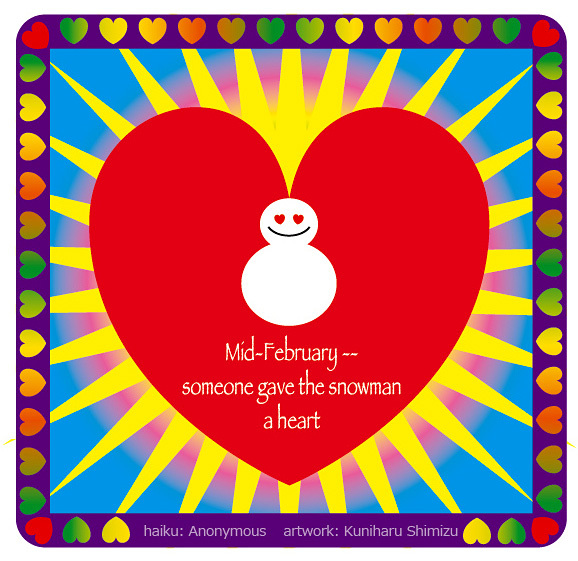 It is a little early for Valentine Day, but here is a haiku of snowman on the Day. 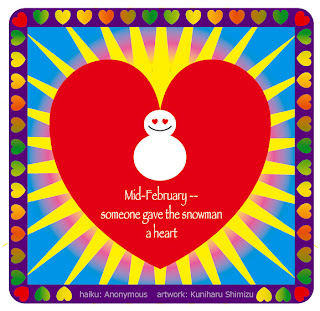 I just have one more snowman haiga to post, which I will post tomorrow, and that seems to be the end of the series. What a cool cool hot hot snowman ! LOL ! Im spite of Frosty or other cute cartoons and fairytales, I never before associated snowmen in such an obvious direct and explicit manner with the warmthness, in fact the torrid level heat, of LOVE ! This haiga is truly one of the most original and smile-producing heartwarming morale-boosting optimistic ones I could ever imagine ! Another very cute snowman. Love it!